Best Roasted Chicken in the freaking world. Period. Do you ever get those moments when you make something and it just blows your mind? Like, how in the world by some freak of nature did I POSSIBLY pull that off? That was totally my afternoon yesterday. I decided I was going to be all proactive about my food prep, and roast a chicken so that I could make some chicken broth afterwards, some soup, some gluten and dairy free mini chicken pot pies, and with leftovers, perhaps some dairy free chicken quesadillas with these soft tortillas, or even experiment with Karina’s Dairy Free Cheese sauce and see if i could come up with a Chicken a la King recipe. I was in the ‘zone’. I was prepared to be The Chicken Queen, with a freezer full of chicken-type dinners to last me AGES. I figured I’d just do a simple roast chicken, and work with it from there. Um…. but then I got a little enthusiastic about seasonings, and it kinda became its own beast…. which was probably a good thing because my two year old nephew was visiting and that little muffie can eat ! Right. Back to the chicken. Honestly, if you are going to do an awesome Sunday dinner that will last you a few days THIS is the way to do it! The dutch oven seals in the steam so that the chicken holds in all the moisture and cooks more quickly. The meat is ridiculously tender, and has a wonderful slightly bacon flavour to it. I just can’t even explain the awesomeness. Now- this does indeed qualify as Paleo with the bacon, and for all purists, you can make your own nitrate-free bacon with this recipe here. Note: Make sure you use a cast iron dutch oven (you know, the cast iron/enamel pot with a lid). If you don’t have one, then corningware with a lid would work, or a roasting tray sealing the chicken tightly with tin foil. It may not trap the steam quite the same way, but it will be ok.
Cut one of the onions in quarters and separate the layers. Cut the second onion into pieces, along with 1/4 of your lemon. Stuff onion and lemon into the cavity of the chicken along with the rosemary (keep one stalk of rosemary aside). Place the chicken in the dutch oven on top of the scattered onion pieces. 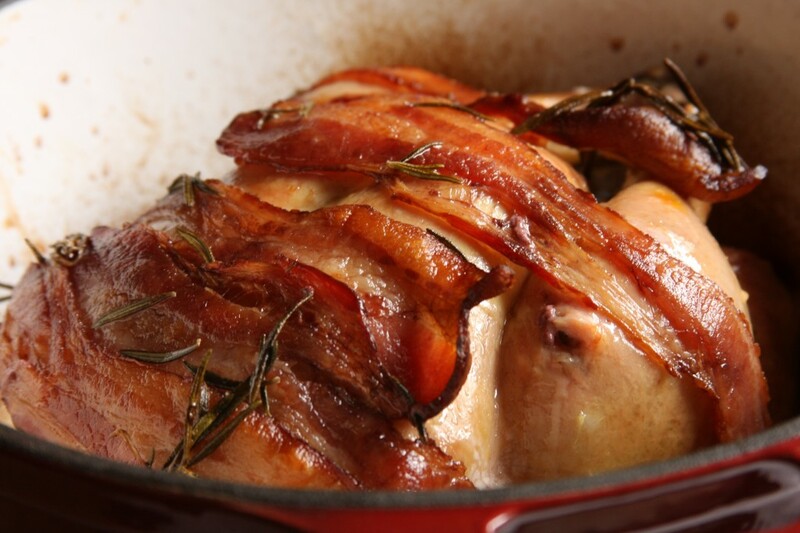 Layer the bacon on top of the chicken, overlapping pieces if you need to. Lay the bacon widthwise instead of lengthwise and it should stay on better. Pour the red wine over the chicken (this will give the skin a slight reddish hue when its done, this is normal. Pour the olive oil over the chicken. Scatter the remaining rosemary leaves over the chicken. Slice the remaining 1/4 lemon thinly and place on the chicken. Cover the dutch oven with the lid, and bake in your oven for 1 hour at 350 (if you use any of the other methods such as corningware or foil, bake covered for 1 hour 30 min). At the 1 hour mark (or 1 hour 30 min mark depending on your cooking method), remove the lid. Let the chicken continue baking for another hour uncovered (if you use the second method of baking, check the chicken after 30 min to see if its ready). thank you Lisa! much appreciated! Hi! Just wanted to let you know that I included your chicken in my post, “An Allergy Friendly Christmas Dinner” today. Looks delicious! Just wanted to follow up with you and let you know it turned out great. 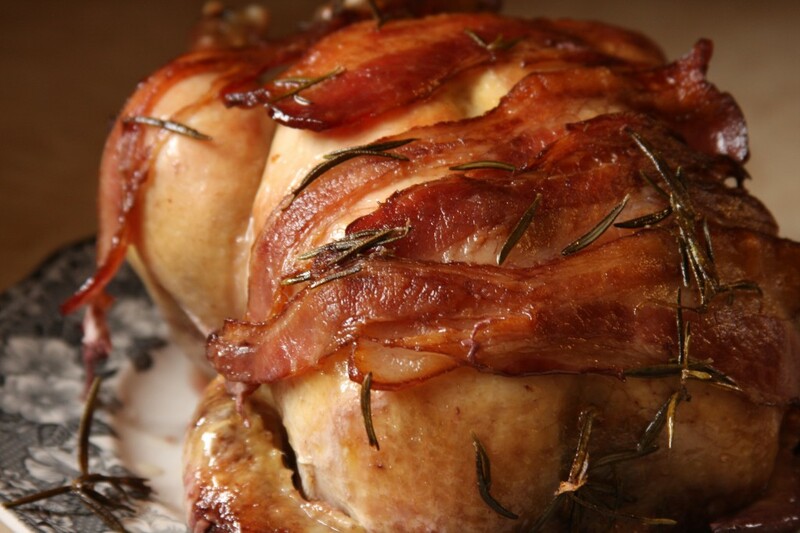 I’d never cooked a bird before, but this was a beaut… thanks for the great recipe! I hope this recipe works for novices. I have never cooked a whole bird in my life, but this post inspired me to go out and buy an organic chicken today. I already have some nitrate-free turkey bacon on hand. I’ll be making this tomorrow. Can’t wait to try it! One question: Did you use sweet onions or the more pungent yellow ones? I love this idea! If I wanted to use a turkey instead, would you recommend I change any of the other ingredients? awww sanx lubee :D i’m glad little meemo liked it :D did it turn out juicy?